Pair of Gio Ponti style 1940s Italian upholstered chairs. The chair has a curved frame with a scallop design. Reupholstered in Italian pink velvet and piping trim details with tapered legs. 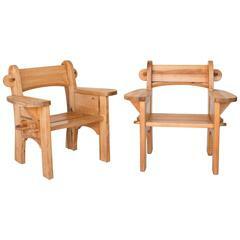 Sturdy pair of chalet style pine lounge chairs with a handsome silhouette and stance. Designed by David Rosén and produced by Nordiska Kompaniet, circa 1938. Pair of lounge chairs designed in the style of Kaare Klint upholstered in well patinated leather on a mahogany frame. Made in Denmark - Great original condition. Chairs are covered in Kvadrat fabric and have stained oak legs.